This is the condo you've been waiting for! Location, location, location! Just steps away from a spectacular five mile stretch of white sandy beach, oceanfront heated saltwater pool, jacuzzi, indoor sauna and the inviting BBQ grill area. Recently updated with beautiful new tile flooring throughout the condo onto the lanai. New hand carved mahogany bedroom furniture, built in closet system, new living room furniture including 42' flat screen TV and new efficient tropical ceiling fans. The bathroom has been expanded and fitted with new tile and top of the line fixtures with extra large shower. On moonlit nights sit on the lanai and look out on lush, tropical grounds and let the 'Aloha Spirit' carry you away. Head down to the manicured lawns, pull up a lounge chair and sunbath under swaying palms or take a 10 minute stroll south along the beach to the Maui Farmer's Market to pick up your fresh pineapple, mangoes and other local produce, including homemade baked goods! There's also a small ABC Store to pick up any last minute items. Enjoy the convenience of the onsite activity booking center Maui Sights and Treasures, licensed massage center Massage Maui, the local bar/restaurant Dina's Sandwitch and the souvenir gift shop Lanis' at Sugar Beach. Sugar Beach Resort is centrally located with the Kahulai Airport only 15 minutes away. Costco, shopping, golf and restaurants all nearby. Check out the live webcam feed at www.sugarbeachwebcam.com! Our family lives in Vancouver, British Columbia. Having been a long time employee in the travel industry we are fortunate to be able to travel to Maui several times a year. We love our Sugar Beach condo, especially sitting on our lanai for breakfast and at sunset. Morning walks along the never ending beach is one of our favourite pastimes. After a year of searching for our piece of Maui paradise we discovered Sugar Beach Resort. The moment we stepped into the condo and walked the few steps from the lanai to the beach we knew this was the one! We haven't looked back since. Sugar Beach Resort has it all and is full of Aloha Spirit. Really it's very simple 'Maui No Ka Oi!' which means 'Maui is the Best!'. The condo complex is well maintained and right on the beach, no roads to cross! The beach has a gentle surf that is safe for all ages. Our corner unit has an extra side window which creates a bright and airy atmosphere. We had a great time in Maui. Thank you Linda for including our grandaughter. She had a ball. This area and condo was a great place to stay. What we loved the most is the area, not to busy and seemed to be in the middle of going to each side of the island. We were within 20 - 30 minutes of going where we wanted to shopping tourist spots, beaches etc. Condo was nice and had everthing you need for your stay. We loved sitting on the lenai in the morning, and during day and nightime. WouLd definately stay again in this condo and in the area. Mahalo for your comments. You are so right about the convenience of our location, that's one of the many things we love about Sugar Beach. This stay at Sugar Beach was an answer to a prayer that I didn't know I was praying. At a point when I needed a respite from my real life, I was fortunate enough to discover this little slice of Paradise. 5 days at a lovely, fully-equipped ground level condo met my every need. You could not find a more convenient place to get away. Just steps from the pool and hot tub, and just beyond that....Sugar Beach. 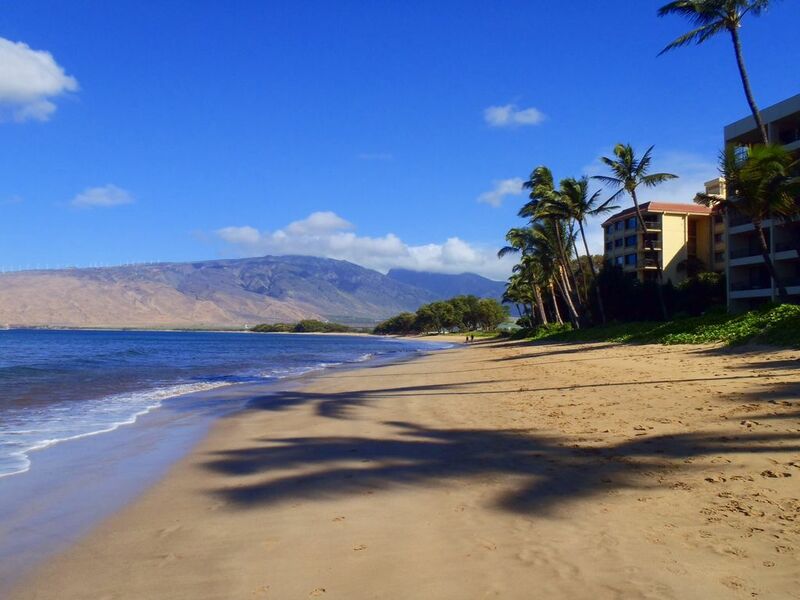 I had a wonderful, relaxing stay and I thoroughly enjoyed being just a couple of minutes removed from the hustle and bustle of downtown Kihei. What a fabulous location and the best part was that the photos accurately display the condo and the surrounding area....a lovely surprise! Book this now for a wonderful experience. We are so happy that Sugar Beach and our Maui home met your expectations, and you were able to relax and get the respite you needed. Maui aloha spirit has a way of doing that! Just steps away from a beautiful, uncrowded beach! Great spot for a couple that wants convenient access to the pool and beach. We were there in February and the whales were very active close to the shore, right off Sugar Beach. The lanai is just a few feet from a koi pond with a waterfall. The waterfall acts as a buffer against the typical noises you hear from people around the pool, which is nice since the pool is so close. There is a decent view of the ocean from the lanai if you position yourself just right - we saw the whales from there! The condo has two nice, low beach chairs and an umbrella (which was a bit challenging to use in the windy conditions we experienced, but still a nice touch), a cooler, boogie boards, really everything you need for a beach getaway. The condo was also very clean. Thank you so much for your excellent review! I'm so glad you saw the whales close to shore and you enjoyed the waterfall and koi pond. We strive to provide everything that our guests need to make their stay memorable. The condo was the perfect headquarters for a visit to Maui. Easily accessible, of course everything is, to all of the points of interest. The condo provided a place to regroup after an excursion. A view of the Pacific from your living room is nothing to sneeze at, for sure. The staff were helpful and the condo and grounds were in immaculate condition. All in all, an excellent value. We are so happy you enjoyed your stay in our Maui home. Thank you for your comments and your appreciation of the staff and grounds at Sugar Beach Resort. One of the reasons we choose to purchase here! Very nice condo literally steps from a very nice beach. Property is very well taken care of and very friendly staff and residents. The condo had everything we needed including all of the beach necessities. A wonderful quiet place away from the resort traffic, but easy enough to drive wherever we wanted to go!! Definitely would stay here again! Aloha Stephanie, thank you for your nice comments, we are so happy you enjoyed your stay in our Maui home and look forward to hosting you again!